Space is a-temporal, which means time does not have physical existence. Building on that premise, Davide Fiscaletti and Amrit Sorli develop a model of the universe based on quantized space. These basic units - quanta of space - can represent either empty space, matter or electromagnetic energy, depending on their frequency of vibration. The highest frequency is that of space without any matter. A lower frequency corresponds to sub-atomic particles, and a yet lower frequency represents electromagnetic waves. The universe postulated by Fiscaletti, Sorli and their group is constantly renewing itself. Active Galactic Nuclei, giant black holes at the centers of galaxies, incorporate matter from stars and planets and transform it into quanta of space. The transformation eventually results in the emission of gas which, in time, forms new celestial bodies. 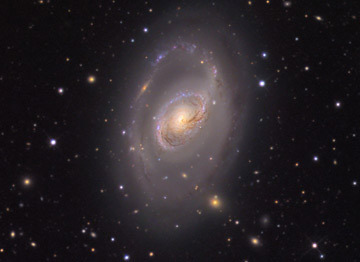 M 96 - Just another galaxy? - See story and credits at NASA's Picture of the Day. Gravitation is a function of the density associated with the quanta of space. The presence of matter increases the density of its corresponding space quanta, and in the manner of "like attracts like", the denser parts of space are attracted to each other, thus matter appears to attract matter. Chemical and biological evolution tends in the direction of higher and higher frequency of vibration, eventually approaching the basic frequency of space. Consciousness is associated with frequency and appears to develop as frequency increases. Pure consciousness has the frequency of empty space. Entropy is associated with matter and energy, but is counteracted by the extremely high vibrations of space and consciousness. Particles of matter do not actually "move" in space but are re-created at each new location along their trajectory by a pattern of quantum waves that determine the material existence of their associated particles. Think of a cathode ray tube, where pixels are activated by a beam of electrons, creating a moving picture for us to see. In physical reality, we have quantized or "pixeled" space where material particles can appear, creating what we perceive as a universe of moving, material reality offering an exquisite variety of perception and almost infinite complexity. According to a-temporal gravitation theory, universe can be considered a self-renewing system that recreates itself. It is an a-temporal phenomenon in which physical space and matter are in permanent dynamic equilibrium, and its total entropy tends to zero. The "stage" of the universe is "space-matter", where time exists only as an irreversible stream of material changes happening in an a-temporal physical space. Universe has a granular structure: its elementary constituents are quanta of space having the size of Planck length and being endowed with different vibrations. We live in a "sea of frequencies": our perception of the different physical entities is tied to the different frequencies of vibration of the quanta of space constituting such entities. In particular, quanta of space constituting empty a-temporal physical space vibrate with the "basic frequency" and have got "non-entropic" energy, while quanta of space constituting matter vibrate with appropriate different frequencies (lower than the basic one) and have got "entropic" energy. Universe has also a wave structure as a consequence of the vibrations of the quanta of space. In particular, the wave structure of the universe has two different types of "components": quantum waves, which are the effect of the vibrations of the quanta of space at the appropriate frequencies characteristic of the subatomic particles, and electromagnetic waves, which are vibrations of the quanta of space at the frequencies of the electromagnetic spectrum propagating in a-temporal physical space at the speed of light. Finally, according to the model here proposed, basic frequency of the quanta of space is a driving force of evolution; it is a physical environment in which matter has a continuous tendency to develop towards life and further on into conscious species. The whole process of evolution from chemical, biological events to the evolution of the human being is a continuous process generated by the basic frequency of quanta of space. Matter has a tendency to raise up its frequency towards the basic frequency of a-temporal physical space. Starting from the idea that time exists only as motion of matter and introducing the concepts of the density of cosmic space new perspectives are opened in gravitation and the interpretation of physical space. In this interpretation, mass can be considered a physical entity which is not so much different from cosmic space (in the sense that it can be seen as the portion of space where the space is denser). The state of gravity-space can be described in terms of two fields, namely the gravitostatic field and the gravitokinetic field, which are defined in terms of the density of cosmic space and of a quantum number j indicating a sort of rotation-orientation of each elementary grain of cosmic space. In virtue of the features of these fields, a wave function of gravity-space and therefore the idea of a wave gravity-space have been introduced. By introducing the concepts of "density of full cosmic space" and "density of the vacuum", it is shown that both Newtonian gravitation and special relativity and general relativity receive a new interpretation. All the typical effects of general relativity are linked to the density of full cosmic space and the density of the vacuum. The UM researchers - Christopher Eling, Ted Jacobson, and Coleman Miller - describe their aether as a preferred state of rest at each point of spacetime. This preferred state would not be the result of something known, such as a gravitational field or cosmic background radiation, but may, they say, arise from the structure of empty space in quantum gravity theory. How can one have frequency or vibration without time ? as far as I can see, the model allows for action sequences (which would include frequency) by acknowledging the sequence of changes in physical matter or states of energy, but it does not give time physical existence besides the present moment. In other words, once the moment is passed, it has no real physical existence any more, and before it happens, it doesn't either. This article discusses that concept in some more detail. My first reaction to this paper is : Nonsense! It is another theory trying to exist without the benefit of any experimental supporting evidence. When are "scientists" going to try to explain what they actually see, instead of inventing new realities so they can play games with mathematics. The universe exhibits spherical symmetry and periodicity, with a period of about 400 million light years, falling off in density from an origin in the direction of Virgo, about 70 million light years from us. You can visually see the effect in the Sloan SDSS survey. The first annular region to the north of the Milky Way has been called the Great Wall! If people want to come up with a new theory, fine. But first explain this! I have just read a new book called, "Absolute Space, Absolute Time & Absolute Motion" by Peter F. Erickson. He makes a very good case that mathemeticians went off into Neverland when they gave up Euclid's ideas about a straight line and Euclidean geometry. Riemann came up with the idea of manifolds. Hilbert tried to reinvent Euclid in a different way. Dedekind came up with "set theory" which eventually led to the disastrous "New Math". And Minkowski and Einstein came up with curved "space-time". Erickson makes the case that space is absolute, even without matter, and curves are drawn in space rather than having space distort. The 2D picture in physics textbooks showing space distorting into a sort of funnel above a large spherical gravitational mass is difficult enough to comprehend in 2D, and a 3d representation probably cannot even be drawn! Erickson also says that time is absolute. Each instant is here, and is then gone forever. There is no "arrow" of time. Time moves forward at the same pace everywhere. Some parts of the universe don't get out of phase with the rest of it just because they are near a large gravitational mass. And Relativity seems to be going down the tubes. As one wag said, "What happens if you are in a car going at the speed of light and you turn on your headlights?" I guess Einstein would say that the light can't leave the vehicle, but in fact it would. So let's stop playing with theories based upon faulty mathematical formulations that have nothing to do with real problems, and then trying to convince the public that there is a real situation out there that has just been solved by pure abstract reasoning. the world is full with theories and assumptions ......... and this is wonderful in a certain way. This means that the human mind tries to go beyond its capacity for a reason. Some of these ideas will proof wrong and others proof right. We have to start somewhere in the twilight zone of thoughts until a clearer picture arises. And if you look at the basic rules that govern the Y-Bias model, Sepp, you will see exactly how it all works. These guys are right on the money. Thanks for the send. are dynamic states (conditions) of absolute vacuum (fluid space) and the fields vary continuously in space. This is the most fundamental discovery and calls for a continuous space substratum with inherent incompressibility leaving no scope for densification or rarefication of space points. Also, through alternate theories positing continuous space, equations of Coulomb, Gauss and Ampere can be derived from electron structure. Such a derivation is not only unlikely but rather impossible to be achieved if space is postulated to be granular. Gravitational attraction is possible to be explained with superposition of gravitational fields (inward field) of two bodies ---- superposition creates asymmetry of fields around the bodies by increase and decrease of the field strengths and thus causing attraction without introducing concept of density to space. wise' is unreal, yet being integral with 'motion' of real entities, time assumes reality. At universal scale, Space-Motion seems to be a more fundamental reality than Space-Time. Thus, Space-Time seems to be an erroneous concept, while in 'Space-Motion', time is inherent and hence assumes reality. But time, dissociated from motion and changes in space and material structure, seems to be only a concept rather than a reality. 1. Time is what we measure with clocks: with clocks we measure duration and numerical order of motion of massive objects and elementary particles in space. There is no evidence that motion happen in time; we can only observe motion in space. With clocks we measure duration and numerical order of motion. Time still exist but not as a fundamental physical reality into which motion happens. Time exists as a scientific tool for description of motion in space. 2. To describe position of two objects A and B in space we need three coordinates X, Y and Z. To describe motion from object A to object B we need fourth coordinate that is time “t”. Time here means duration of motion. When we know speed, we can also know distance that an object or particle has done in space. 3. Time as a “fourth” coordinate of space-time is a “coordinate of motion”, it describes motion of massive bodies and particles in space. In the Theory of Relativity the forth coordinate X4 = c x i x t is called the “time coordinate”, whereas c is light speed, i is an imaginary number and t is the number representing duration of material change. With “time coordinate” one describes motion of objects in space. With clocks one measures interval between material change X and material change X + n, where n represents number of units of time. The smallest unit of time is Planck time; in a Planck time photon pass a Planck distance. Time is a measure of intervals of motion in space. 4. Space-time is a math model only; space-time does not exist as a physical reality. With the model of space-time we describe motion of objects and particles into space. There is no evidence space-time existing as a physical reality. Before Einstein created space-time no one was thinking that space-time is an arena of the universe. Today most physicist think universe exists in space-time as a fundamental physical reality. For that conviction there is no evidence and no experimental proof. 5. Space itself is atemporal. Motion of objects and particles do not happen in time, it happens in space only. Time is not running in space independent and also is not a part of so called space-time as a fundamental physical reality. Space is atemporal and time is by man invented coordinate of motion that describes motion in atemporal space. 6. Humans experience atemporal space as a present moment. Past and future exists only in the mind; physical past and future do not exist; exist only atemporal space. All experiments in physics always run in present moment, because present moment is the only one that exists. We are not aware yet that present moments do not follow each other in the line past-present-future. Present moment is the only one in which motion happens. We experience this motion in a linear mind concept of past-present-future. 7. Time as a “coordinate of motion” is not elementary physical quantity as energy, matter, space and motion are; time exists only when we measure it. The difference between these two times is still not totally clear. Main stream still consider time to be fundamental physical reality not being aware that they “project” their physiological time in physical reality. Universe is an atemporal phenomenon. We cannot think that universe run in time, because we do not have any evidence for that. Opposite is through: we experience atemporal universe in psychological time and we describe motion in atemporal space with physical time that is only a scientific tool and not fundamental physical reality.